Previous studies have demonstrated acute morphologic and functional changes in kidneys following spark-gap lithotripsy. Yet, little data have been presented comparing the effects of second-generation lithotripters with the original spark-gap machines. Two weeks after unilateral nephrectomy, New Zealand white rabbits received shock waves directed at the lower pole of the remaining kidney. 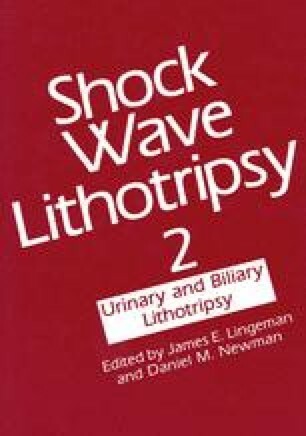 Either 1,000 shock waves at 1,000 bar on a piezoelectric lithotripter (Wolf Piezolith 2300) or 500 shock waves at 21 kV on an electrohydraulic system (unmodified Dornier HM3) were given. Animals were sacrificed on Day 2, Day 7, or Day 28 for morphologic evaluations of their remaining kidneys. Acute pathologic changes found in kidneys treated by electrohydraulic lithotripsy included a significantly higher volume of subcapsular hematomas following treatment when compared to the pathology of kidneys treated by piezoelectric lithotripsy (P < .02). Associated acute parenchymal injury by the electrohydraulic lithotripter included intratubular hemorrhage with punctate areas of necrosis in the cortex and medulla. Distinctly different pathologic changes were noted in kidneys treated by the piezoelectric lithotripter. Acute changes were either no or small subcapsular hematomas in association with one or two distinct areas of renal parenchymal damage consisting of focal hemorrhage and necrosis. With the healing process chronic changes in the electrohydraulic-treated kidneys included extensive subcapsular fibrosis along with rare punctate cortical and medullary scars, involving 4.2% of the total renal volume. Piezoelectric-treated kidneys revealed no evidence of subcapsular fibrosis but rather one or two localized areas of parenchymal fibrosis centered around a necrotic focal center. These areas of injury involved a total of 3.6% of the total renal volume. Although no statistical difference was noted in renal injury by Day 28 between the piezoelectric and the electrohydraulic lithotripters, this study suggests that two distinct types of injury to the kidneys are produced by these two treatments. Supported by USPHS Training Grant #5T32-DK07307.